Thanks Brian, here are more pics of my es-100's. Should take some more but i prefer playing them. The cherry one is lighter then the other 2, also slightly thinner neck, but very close. All necks are a bit different. The sunburst and natural are closer to each other, weight and neck wise, but further apart in serial numbers. When i find the time i'll make some more pics of the bracket. Ha! Now I remember I have seen those whilst searching the forum. Absolutely stunning collection of beautiful guitars. I'm envious you have all three colours! I'm like yourself in that they are there to be played. I have a 1983 Tokai Strat that is on it's third neck because over 30 years of gigging and playing it hard I've worn them out. It's not original anymore but it's a great guitar! 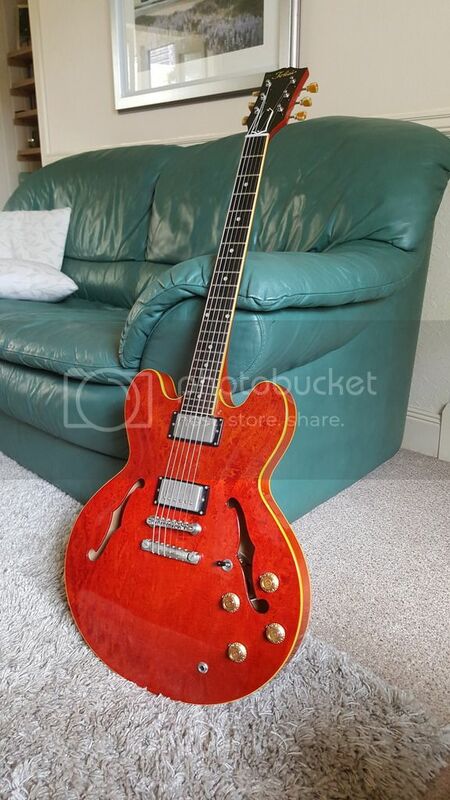 If I find the right sunburst either new/old I just might be tempted. I'm particular with sunbursts as I like the fading from colour to colour to look natural! The bracket on the new Tokai pickguard is the same as the old ones. It is the correct depth on the rim of the guitar but it is glued to the new pickguard in the wrong place to align up with the hole on the guitar. I would simply separate the bracket from the guard, mount it to the guitar and re-glue the bracket to the guard. Fabulous trio, Duff. The Holy Trinity. 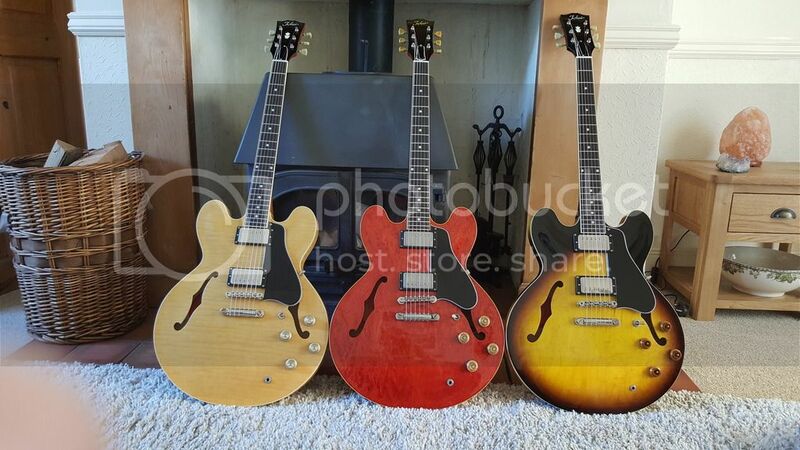 Are the pickups on your ES's still the original ones? Well I've finally got the ES150 set up almost to my liking. The guitar came with a backbow on the neck as it had been stored with no string tension. Personally I don't think that is a good idea except for shipping. I had to fit 11's to it to get some tension on the neck but I always use Gibson pure nickel 10's so I have had to wait until some relief came in to the neck. It's still too straight for my personal preference but it is slowly getting there! It's a very low output guitar compared to all my others but it has a wonderful sound! With medium gain, which is as high as I go, it nails Tom Petty stuff and playing clean it has great compression in the notes for old style rock n roll. The solo to Haleys Rock around the Clock sounds wonderful and really pops out from the neck. It is addictive! I'm really happy I bought it and it is staying until I leave this planet. Having got it playing as I would like I have been going back and forth between it and the new ES158 and they are totally different soundwise. The 158 plays like a dream, a bit more relief in the neck, so it doesn't feel as stiff with the same gauge of strings. It is so louder though! It's a real rocker as opposed to the jazz of the 150 and I have to reduce the gain when I plug it in. It's different in a good way though and both guitars make me play differently which is a good thing. The 158 turns down better than any guitar I have ever owned. It doesn't go muffled and playing it on 3 is still really satisfying. It retains clarity and unlike using a treble bleed circuit it doesn't go thin. It still has bite and body on any setting less than 10. I love both guitars. 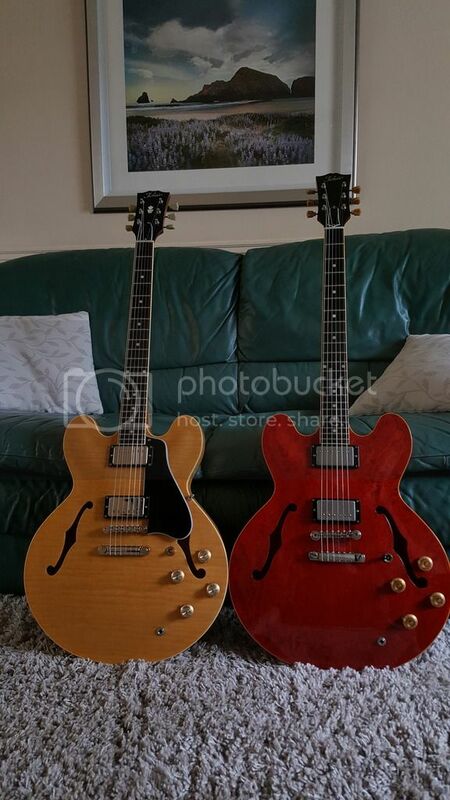 I feel very fortunate to have two 335 type guitars that are great in their own way. It doesn't always happen but somehow the stars aligned this time. Beautiful couple! Maybe try top wrapping the es150 if you want to have it feel less stiff without changing string gauge? My natural one is topwrapped with flatwounds. Love it. but to my surprise the repair has been stable and it's my best playing guitar. The pickups are too high output to my liking so i might change them. so it was completely stripped and refinished in a very thin coat of nitro which started checking. The repair is invisible. Had shed paf daddy's in it, but i rotated the magnet in the neck for an out of phase sound. Great guitar. 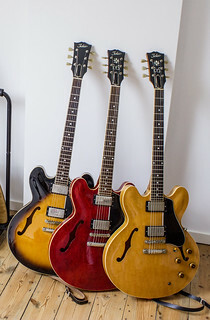 The es-100's all have their original pickups. I quite like them altough i wanted to try the ox4's in one of them. 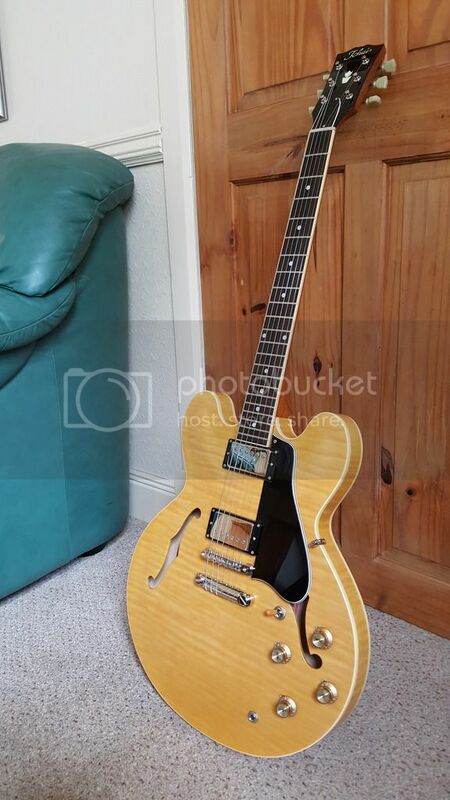 The te-150 is a rare bird and i love the guitar, but sometimes i feel the V neck isn't for me..
Been wanting to sell it but then changed my mind. Would love a smaller neck but am afraid another one won't feel and sound as good as this one. Added a fender japan st71, tokai jb60 and pb60 since those photo's. Hi Duff.........cough!......the ES150 is top wrapped in the pic at the bottom! And you are not hi-jacking the thread! You have some great guitars and I am loving your 3 semi's! Discuss what you like. ah sorry i was posting from my phone and ofcourse didnt see that you already top wrapped..
Forgot to say, the sunburst is a bit softer then on the pictures..
And i like those black bell knobs on the cherry Emiel! nice! Looks like a beauty! I don't think I have ever seen a 150J pic or maybe if I have I never looked closely enough! I'm glad you can read Japanese....I struggle with the long words!